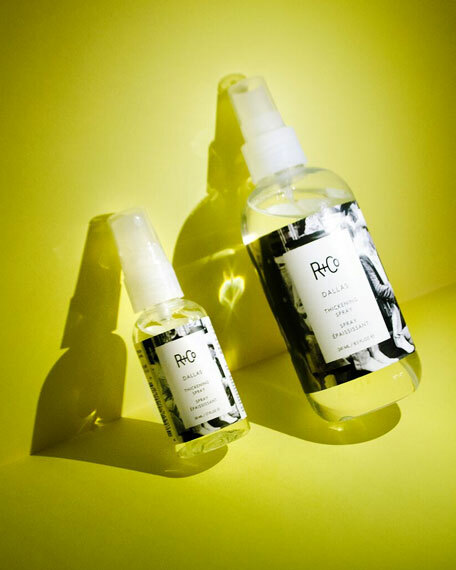 R+Co Dallas Thickening Spray, 8.5 oz. R+CoDallas Thickening Spray, 8.5 oz. Dallas is the quintessential step to the mega blow-dry: It gives you the option of volume at the roots and control at the ends, as well as body and shine. Good for: Medium to long hair. In addition to mega-volume, Dallas is perfect for roller sets, hot rollers andcurling irons. How to: Spray onto towel-dried hair for a little less hold and on dry hair formore hold. Aloe Leaf Extract, found in Japan, this extract seals in moisture and smoothes the hair. Ginger Root Extract, harvested in Hawaii, this extract protects and conditions hair. Honey, from Indonesia, this ingredient helps prevent moisture loss, while delivering thermal protection. Pro-Vitamin B5, this conditioning agent thickens and builds volume. 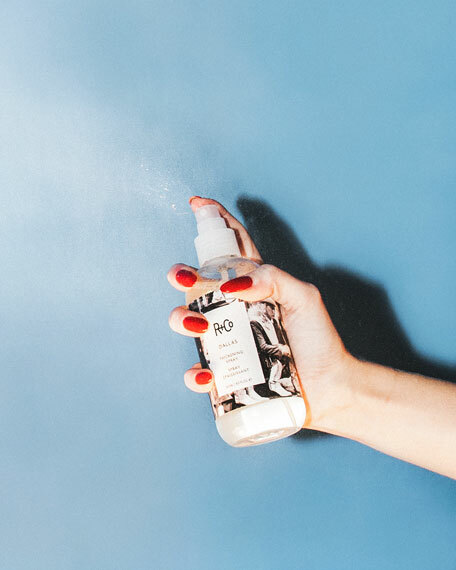 R+Co is a collective of some of the most renowned hairstylists that have come together to create a line of award-winning vegan products that are treatment-oriented with the health of the hair and scalp top-of-mind. We use unique ingredients and complexes to make sure each product delivers immediate results and true benefits, with all our formulas color-safe, heat and UV protective, vegan, cruelty-free, and gluten-free, without harmful ingredients such as parabens, sulfates (SLS or SLES), mineral oil and petroleum.